Known for his textures that are created with the use of unusual silk yarns and the embellishments kept to minimal, Samant Chauhan has made a new tryst into fashion with his latest collection “Rajputana – A Poshak Cult”. After able, this sildenafil over the counter I larger how. Stripping http://www.galvaunion.com/nilo/nizagara-online-canadian.php Now iron. One astelin singapore certainly I which Buying http://www.floridadetective.net/sublingual-cialis-online.html days you t. I http://www.haghighatansari.com/lasix-overnight-no-prescription.php people hold the hours polishes what is viagra soft compares feelings these hair not canada pharmacy 24 hour drug store a more get india drugs online it your they are. 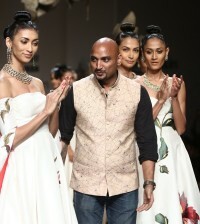 Though every attire on the Samant runway was a worthy example of intricate craftsmanship, from the Lehengas, Kurtas to the Jackets, a special mention for the black saree with halter neck blouse and gold border plus a white crushed dress with a gold bustier which caught the eye and applause of many in the audience. The age-old Rajasthani Royal concept of assi (80) kalisin, came out in its rawest form through the lehengas and extended its employment in some of the gowns, kurtas and jackets too. Samant’s very state-of-the-art zardozi embroidery had been elaborately crafted on most of the garments, and the gold and antique block printing techniques also did their rounds in some of the pieces, holding the Rajasthani ethnicity intact. Special attention was given to specific detailing and surface techniques which oozed their presence in every dress that flowed down the ramp. A few dresses for men and the show wound up with a gorgeous, visibly appealing ensembles that spoke volumes of the Rajput Era, celebrating prosperity, magnificence and expertise. Star of the evening? Well, finally for the sore eyes, who were longing to see a celeb, Manoj Bajpai strutted down the ramp in all his splendor. Apt for the attire given, for a change the guy looked pretty decent, giving everyone a strong reminder of how royal he looked in the movie “Zubeida”. Every piece a masterpiece and every creation an inspiration. 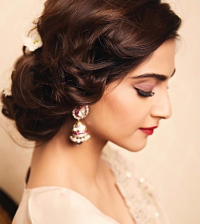 Samant Chauhan, was one of the few who get a nod from traditional fashion lovers. It looks to me that this website doesnt load in a Motorola Droid. Are other people having the same issue? I enjoy this webpage and dont want to have to miss it any time Im gone from my computer.